You have probably seen canopies all around you, but have likely never given them much thought. A common sight at gas stations, entrances to buildings, and over toll booths and walkways, canopies serve an important purpose for a wide range of industries: To provide shelter and protection for people, vehicles, and equipment. In today’s blog, learn more about what canopies are used for, what a pre-engineered canopy really is, and why Shelters Direct is your best source for quality pre-engineered steel canopies for any application. And don’t forget to check back each week for a new blog about everything you need to know about shelters, canopies, and booths. Pre-engineered canopies are useful for a wide variety of applications. 1: What is a Canopy? What is a pre-engineered canopy and what does pre-engineered mean? Canopies are a basic structure that are used to provide shelter and protection. Whether it’s vehicles, people, or equipment that needs to be protected from the elements, a canopy will provide an area of shelter at your facility. Our canopies are manufactured out of steel, which ensures they are constructed with strength and rigidity. “Pre-engineered” means that the majority of the canopy is designed for you beforehand. The canopy is welded together offsite and then delivered in pieces so that it can be assembled at your facility. Our canopies are designed as a bolt together system, so putting it together at your facility is much like building with an erector set (on a much larger scale, of course!). One of the many reasons pre-engineered canopies are so popular is because they are very cost-effective for the user. 2: What purposes do canopies serve and what are their most popular uses? A canopy is incredibly useful for protecting the lifespan of the equipment that it houses as well as shielding employees and visitors from the elements. Because they offer shelter from rain, snow, hail, and other detrimental weather events, they provide crucial protection for vehicles, people, equipment, and other applications. Any sensitive equipment that should not be exposed to the elements should be sheltered by a canopy, whether that equipment be a gas pump, ATM, or a toll booth. Canopies are useful in a wide variety of applications and are fabricated specifically with their eventual use in mind. 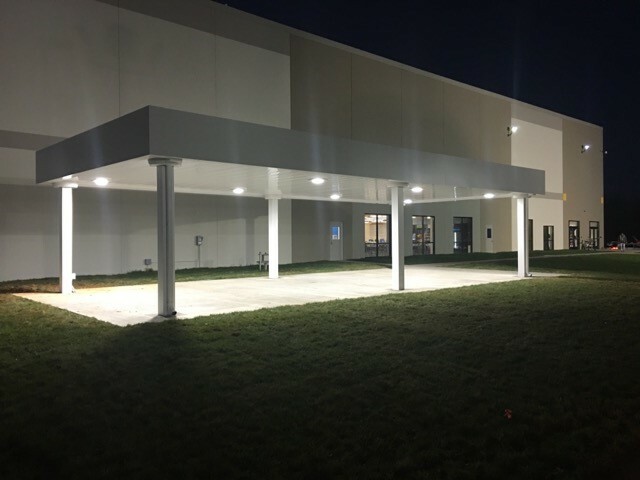 Whether you require shelter for smoking, equipment storage, vehicle inspection, walkways, loading docks, toll booths, or just about any other application, Shelters Direct has the expertise to supply and install the right canopy for the job. When you need to control vehicle traffic at the entrance to a facility, a canopy is often an important element to consider. Whether a stop is needed to check IDs or paperwork, the right canopy will protect visitors, employees, and vehicles and provide a trusted level of security. At Shelters Direct, we have supplied canopies for a wide variety of industries, including the military, government municipalities, and Fortune 500 companies. Military entrances require strict security protocol to prevent security breaches, and the appropriate entrance canopy can help keep any government facility secure. We are capable of providing canopies that meet Anti-Terrorism and Force Protection requirements under UFC 4-022-01. A high quality steel canopy can provide protection from the elements during truck and vehicle inspections. Our durable pre-engineered canopies are ideal for this purpose and will protect inspectors and drivers from inclement weather. 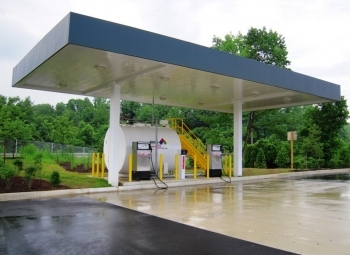 Pre-engineered steel canopies are ideal for use in fueling facilities to protect both equipment as well as customers. In addition to providing protection from the elements, steel canopies also help to prevent stormwater runoff which protects the environment from harmful and often dangerous pollutants. Our canopies can be customized to meet the needs of your facility. Canopies are often a necessity for toll booth applications. They provide drivers with protection from rain, sleet, hail, and snow, and ensure that money and tickets can be exchanged without interference from the elements. Whether a canopy is needed for a highway toll booth or the entrance to a state park, Shelters Direct can supply the ideal model for the purpose. 3: How are canopies constructed? Because our models are pre-engineered, no onsite welding is required and once the pieces are delivered, all that is required is a straightforward bolting together of all of the components. Delivery and installation is a simple and streamlined process, and by trusting an experienced company like Shelters Direct, you can be assured that the job will be done efficiently and correctly. 4: What are the benefits of putting a canopy together on-site? By offering pre-engineered canopies, we can ensure that no hot work must be done onsite and that installation will be a smooth and simple process. For facilities that store flammable materials and chemicals on-site, the fact that no welding is required is an important safety benefit of pre-engineered models. Another benefit offered by pre-engineered canopies is the fact that they are fabricated in a controlled environment, which means costs are managed and no unexpected snafus will slow down the process. This means that it is an extremely cost-effective method that won’t invite the possibility of going over budget. 5: What are the standard features of a canopy? A standard canopy includes not only the steel structure, but also a complete design of the footer system to ensure that the shelter will be anchored properly so that it is able to withstand the environmental impacts it will be subjected to. Anchor bolts are included and shipped to the job site ahead of time to ensure a streamlined installation process. We also provide a complete canopy design to ensure that your canopy will meet the specific needs of your facility. A standard canopy will include P.E. stamps, drawings and calculations, a choice of ASTM round or square columns, ACM fascia that requires no maintenance, and interlocking deck pans. The canopy’s decking will be finished with polyester paint that is baked over an epoxy primer to ensure long-lasting results. Finally, your canopy will include a drainage system that includes the use of internal or external drains and gutters as needed. By providing a comprehensive canopy solution, we can ensure that your shelter is durable and built to last. 6: What canopy options are available? The canopies we offer can be customized in a variety of ways to provide the perfect solution to your facility’s needs. A mansard roof (also known as a French or curb roof) can be chosen for the height of your canopy. If your canopy will be constructed on uneven terrain, we can design it to include footer elevations to provide stability. Our canopies are standard with standing seam gable and hip roof assemblies that can be constructed from your choice of metal. Another useful canopy option is the addition of LED lighting. This can be installed underneath the canopy. This is an especially important consideration if your canopy will be housing critical equipment or will be used to shelter a walkway, as proper lighting is an incredibly important safety concern. Internal electrical access conduits can also be installed if access to electricity will be needed. With all of these available options, Shelters Direct can create a customized canopy that is constructed to the specific needs of your facility. No matter what purpose your canopy will serve, Shelters Direct can design and install one that will meet all of your business’s needs. 7. What canopy projects has Shelters Direct worked on? Shelters Direct has extensive experience with supplying and installing canopies throughout the United States. We have completed a wide range of projects across a vast number of industries, so we have the skills and experience needed to complete any canopy project. This canopy was installed for the City of Alexandria Nutrient Facility to house equipment. For over 15 years, Shelters Direct has been a trusted source for the supplying and installation of canopies, shelters, and prefabricated booths. We work with a wide variety of clients throughout the United States and abroad to provide quality products and expert installation so you can be confident that we will get the job done right. Interested in learning more? Contact us today! And don’t forget to keep up with us on Facebook, Twitter, Google+, Pinterest, and LinkedIn too. This entry was posted on Friday, February 19th, 2016	at 4:39 pm	. You can follow any responses to this entry through the RSS 2.0	feed. Both comments and pings are currently closed.